Occasional light rain. Low 41F. Winds W at 10 to 20 mph. Chance of rain 80%.. Occasional light rain. Low 41F. Winds W at 10 to 20 mph. Chance of rain 80%. 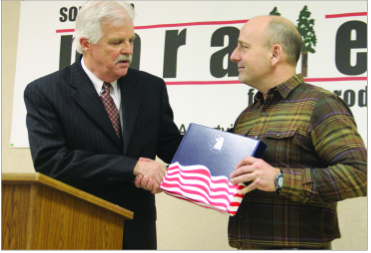 Richard Glazier, president of Southern Parallel Forest Products Corporation, announced Wednesday his company will soon reopen the old Albertville sawmill. The old Albertville sawmill, formerly Bowater Lumber, will soon reopen under a new company. Rainy weather did not dampen the spirits of local city, economic, state and company leaders Wednesday afternoon when Southern Parallel Forest Products Corporation announced it will open the doors of the old sawmill in May. The privately owned forest products company is based in British Columbia, Canada and was incorporated in Dec. 2010. Citing a “pine beetle epidemic” and lack of a skilled workforce in Canada, Southern Parallel leaders decided to open operations in the states. Thanks to professional relationships with former Bowater executives and local economic developers, the company visited Albertville in Feb. 2011 and quickly knew it was the place they wanted to be. 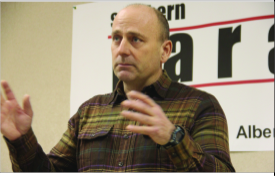 Virginia Lessard, corporate controller for Southern Parallel, said company officials did not want to open the sawmill and have to lay people off or shut down operations later because the market would not support it. “In this road to getting here, … we’ve already made a lot of friends,” he said. “We see that the future is not in western Canada anymore. The future is in the southern plantation areas. “There’s a stable workforce that’s going to show up for work every day, and that’s a struggle we’re having back home. The company’s head office will be in Albertville. It will begin operations with one shift and progress to two shifts. At full capacity, officials expect the company to employ around 130 people and produce more than 100 million board feet of southern yellow pine dimensional lumber for the domestic market. The company is also converting the wood pellet fired boilers used by Bowater into natural gas boilers, which means they will be “big customers for the Marshall County Gas Board,” according to Arnold. Albertville Mayor Tracy Honea, state legislators Kerry Rich and Clay Scofield and Alabama Forest Products Development Center Director Ken Muehlenfeld were on hand for the announcement and expressed their appreciation to the company. Get the latest breaking news from The Sand Mountain Reporter newsroom. Sign up today! Does Marshall County need a dog pound?